Remember to set your IDE Hard Drive to Master before use. This cable allows you to connect the Hard Drive with easy. It allows you to connect to 3 different kinds of HDD, namely 2.5 IDE, 3.5 IDE and SATA. It avoids a lot of plug and unplug thanks to this various connectors. All three HDD can be used at the same time. 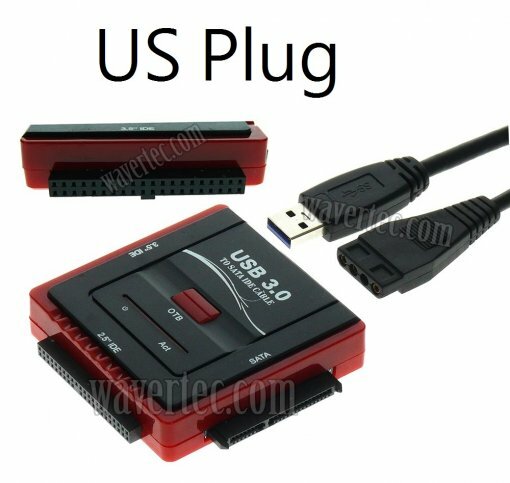 If you connect the USB to USB3.0, power will be drew from the socket to support 2.5 IDE and no external power will be needed. 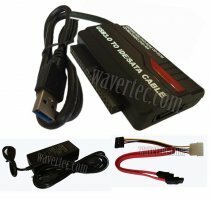 If you connect to USB2.0, an external power will be needed. 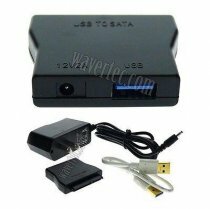 3.5 IDE and SATA will also require external power no matter connecting to USB2.0 or USB3.0. Connect to power if more than one HDD is on use. 2.5 IDE, 3.5 IDE, SATA, all three HDD can be used at the same time. USB side is compliant to USB3.0. 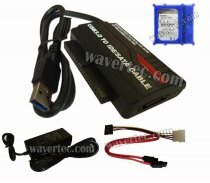 USB3.0 which provide power to 2.5 IDE HDD. 3in1 adapter cable; avoids lots of plug and unplug. Carry an OTB One Touch Backup. Plug and Play for most of the Windows OS. This item alone cannot change the speed of any attached devices. The final speed depends on the main board and the accessories connecting.